Dining in room that is nearly 500 years is what I call dining in style. 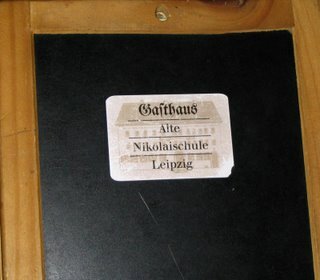 The Gasthaus is just that, and has seen the likes of Richard Wagner study within its walls. It's pure history and the interior just makes you want to drink beer. We chose the place because it was the only thing open on New Years Day. Mental note: don't try to do anything on that day because you'll find all the shops closed. From the outside it appears to be like any building in Leipzig, that is to say old and beautiful. The menu was posted on the wall next to the door, so we took a peak. Seemed reasonably priced, and it was open "until whenever people stopped coming in and ordering food." My other reason for going there was that I wanted a nice plate of schnitzel, the pork variety, before returning to Egypt. So in we went. On the wall outside the 2nd set of doors was a timeline listing all the significant events that had gone on inside the building. Some other famous people had studied there, so that made the prospect of eating there even more tantalizing. Now, this room wasn't going to win any interior decoration awards, but that was indeed a good thing. The walls were a simple white and had some latin writting along the top...great of authenticity. In short, it was the simplicity, combined with the high ceilings, that made this place so inviting. And you could just imagine the scholarly legends sitting in the corner dictating some great theory to their noble assistants. For food, I went with a local soup, with a long German name that I can't remember (Johanna? ), the schnitzel, and German white beer. There was also rumoured to be horse on the menu, but this was never verified. What I appreciated most about the menu was that there was always local specialties to choose from. The soup was great. It consisted of black lentils and broth, and came with a slice of pumpernickel. I wolfed it down and got ready for my schnitzel. Not that I was dissappointed with what arrived, but it lacked a sauce to bring the potatoes, cauliflower, and meat to life. Regardless, the schnitzel was definitely tenderized in-house, and not taken out of a package. But, still, it was not as thick as I remember it being 11 years ago in a Dusseldorf pub. All in all, I'd recommend this place, if just for the ambience. And I think I came out feeling a little bit smarter. Oh god, schnitzel. Mom and I had this long drooling conversation about German food over Christmas. We determined that a food tour of Europe is necessary. Is Ryan off his rocker? Or is he just seeing things...? The background was there...but then I took it out. The words were too dark. Are you just messing with my mind?! Btw, "Gasthaus" means nothing else than restaurant. So for the restaurants reviewed section: the actual name of this restaurant is "Alte Nikolaischule". Review a restaurant near you.